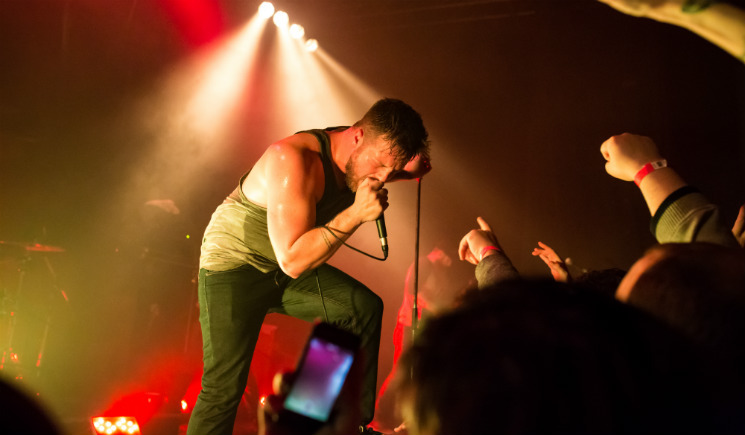 Hundreds of people packed into the Garrick Centre to witness Protest the Hero play Kezia from front to back last night (November 14), proving that ten years later, their debut album has truly stood the test of time. On that release, the quintet seamlessly strung together ten tracks telling a complex story, and wrote some incredibly technical riffs, something that's even more impressive when you consider that they were still in their teens at the time. It also happens to be one of those records that appeals to all fans of heavy music, not just metal heads — something not every band accomplishes. Going into the show, one knew exactly what they were getting, and the band's original line-up — including departed drummer Moe Carlson and bassist Arif Mirabdolbaghi — did a great job of delivering what the crowd expected. Aside from the backup vocals being a little low, the guys proved they are still very capable of playing the complex parts they wrote. The only thing they didn't recreate in the flesh was the acoustic guitar solos and backing vocals of Jadea Kelly — the original recorded versions were simply played over the speakers when necessary throughout the set. "Turn Soonest to the Sea," one of the best tracks on the record, was a highlight, prompting a memorable sing-along near the end when vocalist Rody Walker shouted "No woman is a whore!" One of the original singles, "Blindfolds Aside," received a warm reception, and the band dedicated "Nautical" to Propagandhi's bassist Todd Kowalski, who was in the crowd rocking out just as hard as everyone else. The guys also came out for an encore even though they never used to bother with them. They played three songs, the last of which being a very passionate and energetic performance of "Bloodmeat." And of course Walker was still entertaining the crowd between songs, though he has toned it down a bit and isn't nearly as vulgar as he used to be. He started off the night complaining about an ingrown hair growing on his neck and then someone tossed a bra onstage, which became the next topic of his banter. He joked that that guitarist Tim Millar should save it for when his daughter goes through puberty and of course, he wore it for a bit before it was tossed back into the pit. The grossest thing he did that night was play a game he called "Mama Bird, Baby Bird" which is essentially where he tried to spit beer into someone's mouth. Opening duties went to Mandroid Echostar, a progressive metal band hailing from Guelph, Ontario. Despite the fact that they performed without a bassist, they sounded sharp and had some pretty cool guitar solos. Still, perhaps the most striking thing about these guys is that their lead singer, Michael Ciccia, looks and sounds like the long lost twin of Coheed and Cambria's Claudio Sanchez. Even though tunes like "Paladin" are way more technical than what Coheed writes, the similarity is still totally there. Winnipeg metalcore band Waster snagged the first spot to play one of the few shows they've played so far this year. They were definitely the heaviest band that night, but they weren't particularly energetic as they played tunes like "Ghost March." Still, it didn't stop some people in the crowd from head banging as hard as they could, either.